Learn how to crochet cables - full color instructions. Crochet Cables - Fun and Effective. If you want to learn to crochet cables, you've come to the right place. Just read the instructions, follow the pictures and try it out for yourself. There are many ways of working this versatile stitch, but 4 stitches wide and 4 rows long is the most basic version. For a fairly close fabric work the bulk of the fabric in half double crochet stitch (hdc) and the cable twists in double crochet (dc). 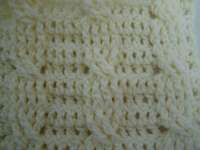 The sample above is worked in double crochet with treble crochet (tr) twists. The longer stitch is used in the cable rows to keep the tension more uniform and prevent the fabric from bunching inwards. Instead of working into the top of the stitch below, the crochet cables are worked around the 'post' or stem of the stitch below. In other words, your hook goes through the gap to the right of the stitch below, and back through to the front on the left side of the stitch. There you yarn over and bring that back to the right side of the stitch then complete your hdc or dc. If that wasn't very clear, read on and you'll see what I mean once you try it for yourself. It's always easier to learn by 'doing'. Start by working 13 chains. Double crochet into the 3rd chain from hook. Double crochet into each chain to the end (12 stitches (sts)). Turn, chain 2, work 1 double crochet into each of next 3 stitches. (bpdc - back post double crochet)Work double crochet around the back 'post' of each of the next 4 stitches. (That means that you yarn over, push your hook through the gap from the back right of the next stitch below across the front and through to the back left of the stitch, yarn over, pull the yarn back through to the right and finish your double crochet as normal - 4 times total.) Then work 1 double crochet into the next 4 stitches. (Cable row) Turn, chain 2, work 1 double crochet into each of next 3 stitches. Skip 2 stitches, work 1 treble crochet around the front 'post' of the next stitch. (Yarn over twice, push your hook into the gap to the right of the stitch below from front to back, around the back of the stitch and out at the front to the left of the stitch, yarn over, pull back through to the right and complete your treble crochet as normal.) Work 1 treble crochet around the front post of the next stitch too. Go back to the first skipped stitch and work 1 treble crochet around the front post of that stitch, then work another treble crochet around the front post of the second skipped stitch. Work 1 double crochet into each of the next 4 stitches. Turn, chain 2, work 1 double crochet into each of next 3 stitches. (fpdc - front post double crochet)Work double crochet around front post of the stitch below. (Yarn over, push hook from front to back through gap to right of stitch below, around back of stitch and out to front at left of stitch, yarn over and pull back through to right. Complete double crochet as normal (4 times).) Work 1 double crochet into each of next 4 stitches. Rows 2 - 5 form the crochet cables pattern repeat. There you have it - instructions for working basic crochet cables. Now you just need to practice. Cables are great for scarves, hats, sweaters, ponchos, wraps, even socks. There's nothing better than a nice bit of texture to liven up a plain piece of crochet! Try working afghan squares with crochet cables for a real cozy feel. Stitch them together so that the cables make a basketweave pattern - one up/down, one left/right and alternate them the next row too. Cables - I love them - the more complex designs the better for me - I love a challenge. You should start off easy and progress though, so start here today with the basics. Get fun and funky with the crochet loop stitch! Try the V stitch crochet pattern for an open design.